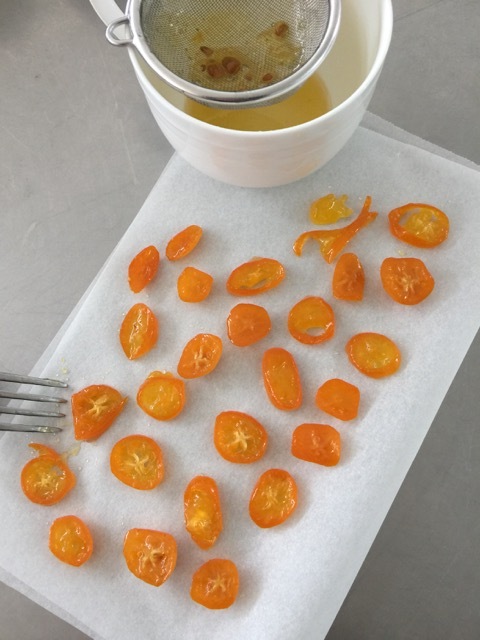 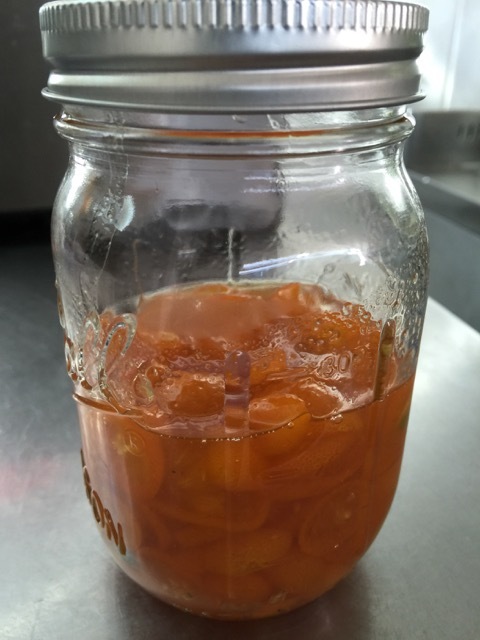 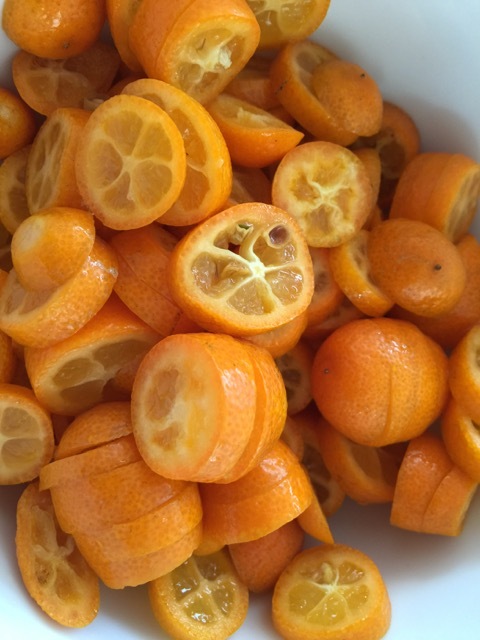 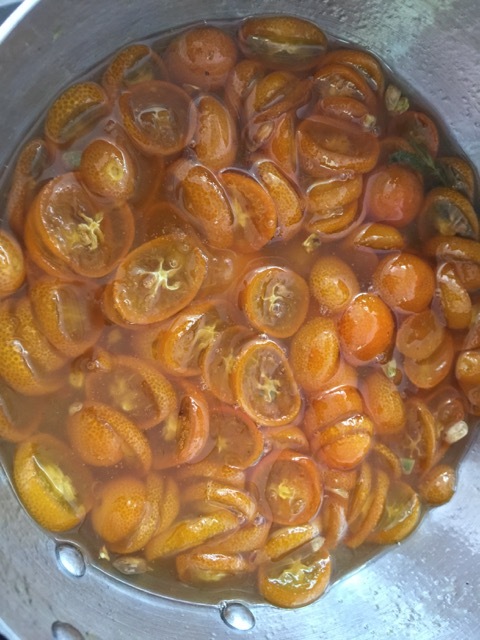 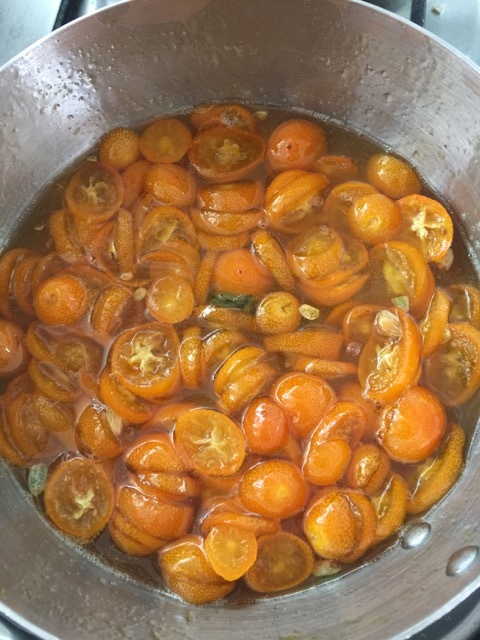 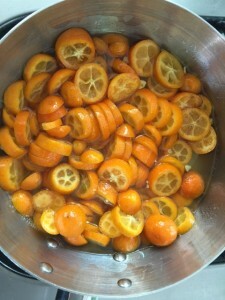 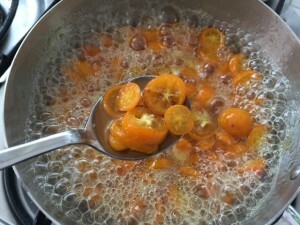 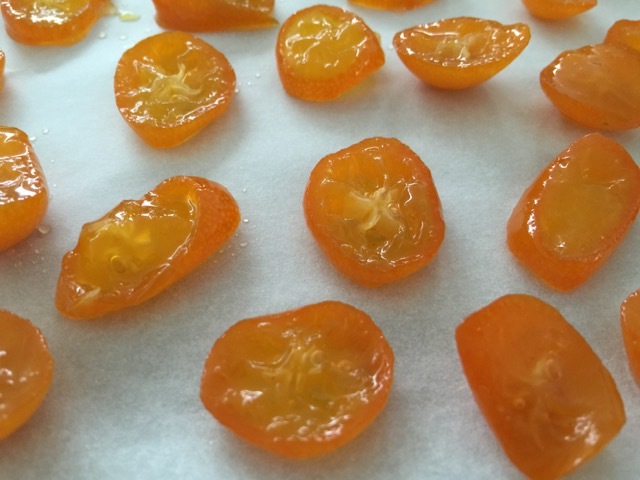 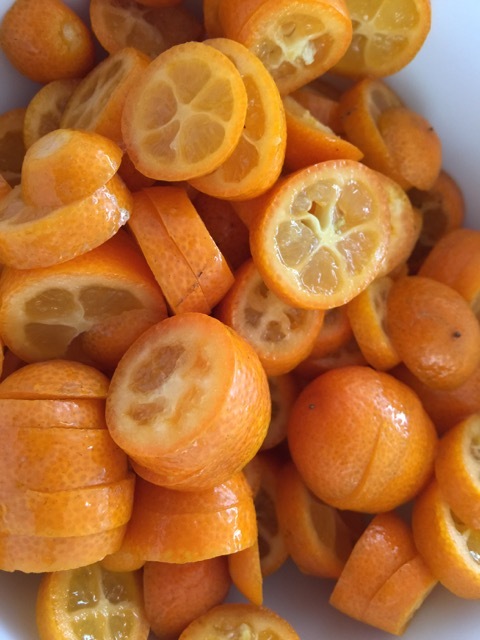 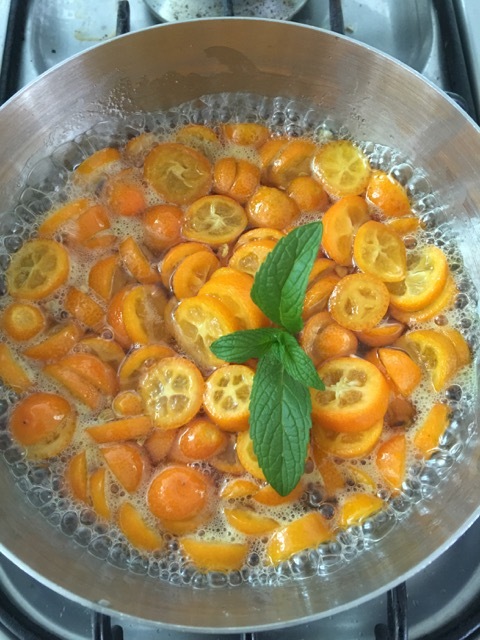 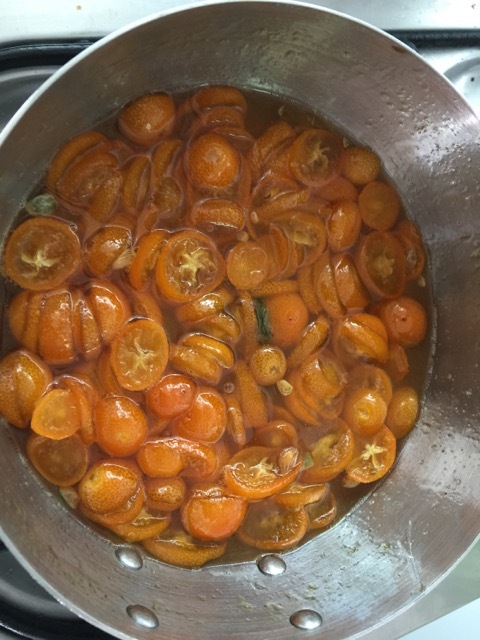 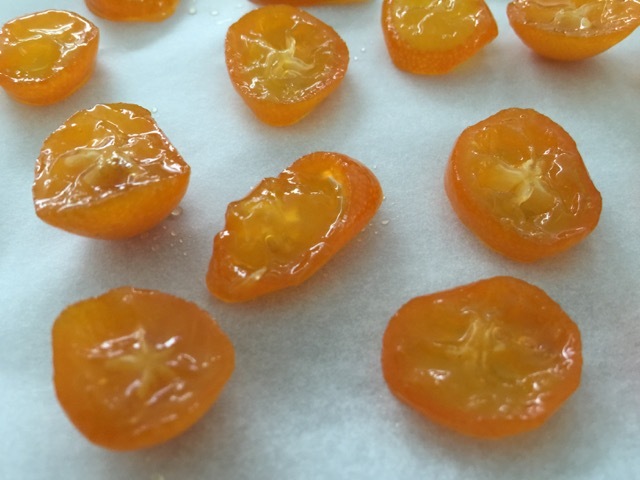 So what to do with the Kumquats… here is a very quick and simple way to get two useful and intensely flavoured items. Candied slices and a syrup both of which can be used with deserts or for that matter anytime you want a citrus ‘hit’. I love the favour of Kumquats but often have a hard time working out how to incorporate them into a dish. 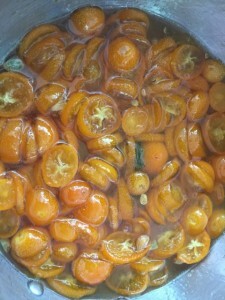 This process also preserves them well. 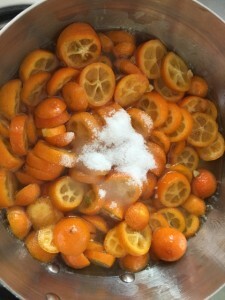 It is basically a light runny marmalade where the slices remain intact enough to separate out for drying or use immediately. 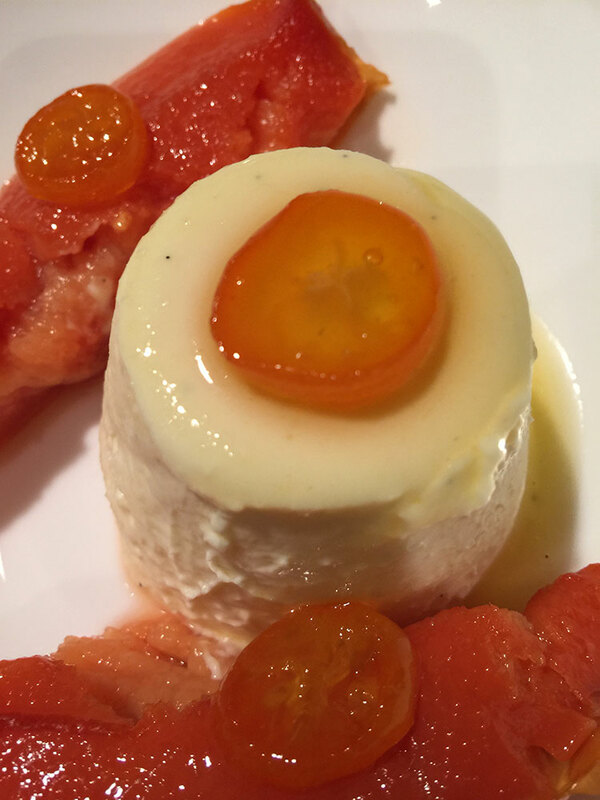 Serving suggestion… Slow 3 hour baked Quince with Vanilla pod Pannacotta and candied Kumquat and syrup. 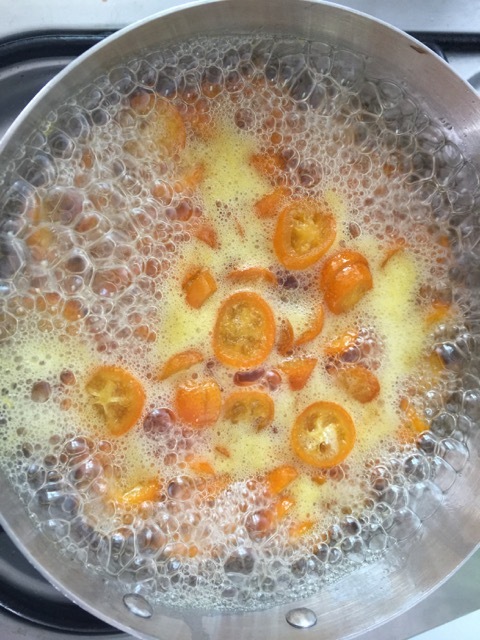 You are looking for a light and runny sugar syrup flavoured with the ‘run off’ juice and essence of rind from sliced Kumquats. 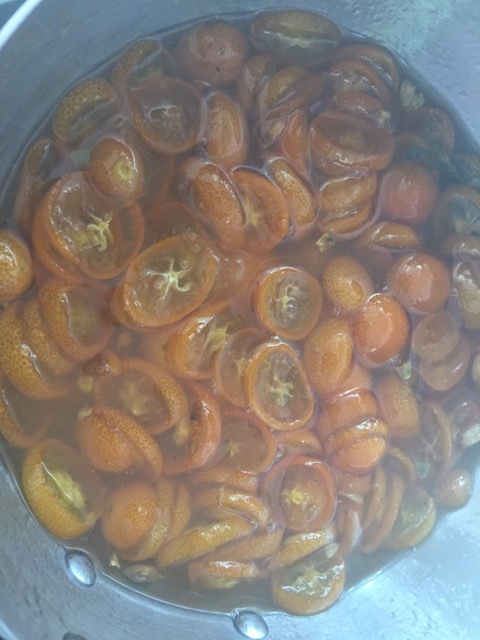 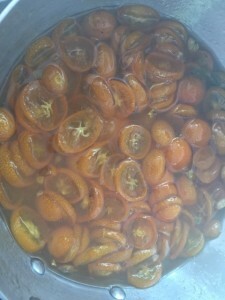 Any Kumquat will work but the Meiwa varieties are probably the best if you can grow or get them. You can do the same thing with a wide range of Citrus fruit as long as the slices are quite thin and don’t have too much pith. 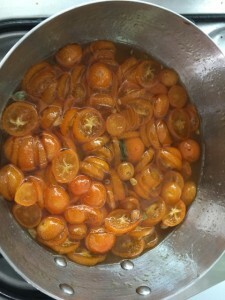 Blood oranges and true Grapefruit work well this way too. 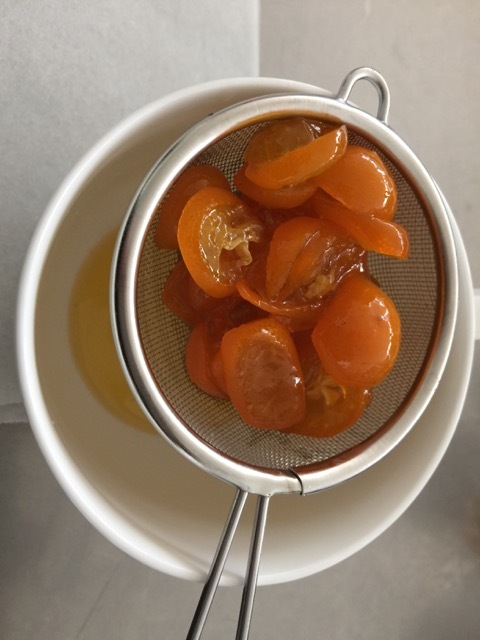 I leave the pips in for the extra ‘setting’ power of the pectin in the seeds and they are not often very large and can be easily be separated later with a sieve or filter of some sort. It is not hard to get a really good tasty result that will last some time like marmalade if fully sealed and a fair time just sitting in the fridge. The syrup can also be used like a cordial with hot water added. 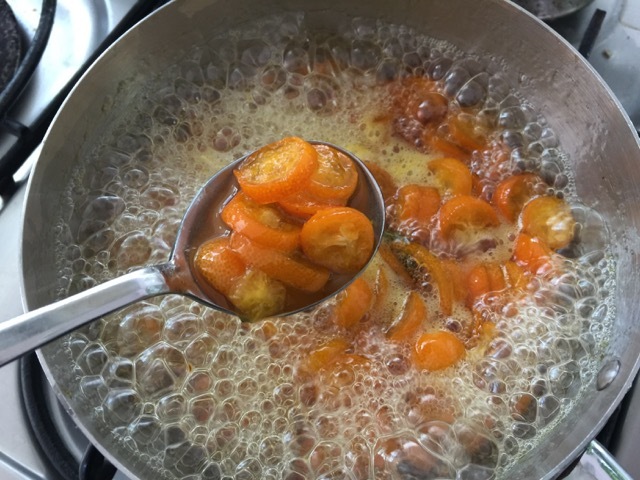 Then castor sugar to taste – The amount of sugar you use is optional but helps it to both create the syrup and preserve the fruit. Fine white castor sugar is best for this type of use but you can use any type – use raw cane sugar for a ‘hearty’ additional flavour touch. I used about 60-80gms for this batch which you can see is probably about a 1:2 ratio of sugar to fruit. 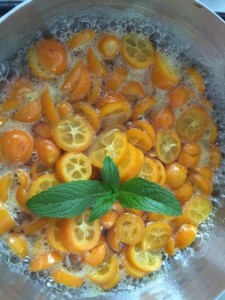 I like to add a small sprig of spearmint to the mixture for a tinge of ‘mintyness’. 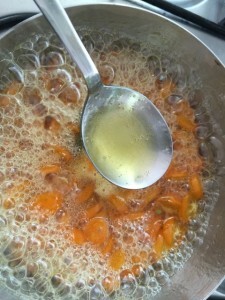 Next you heat till it all bubbles and froths preferably stirring frequently or constantly. 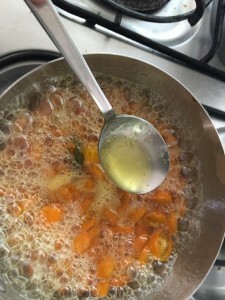 You cook till the fruit starts to turn translucent – try not to heat it too high if not stirred as it will burn easily and discolour the fruit and syrup and alter the taste. 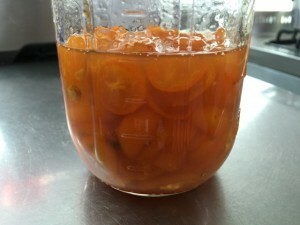 You can usually feel the syrup thickening as it gets to the point of translucency. 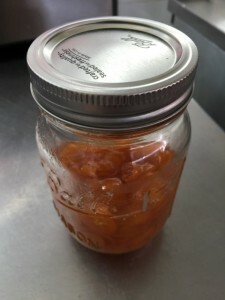 Then you leave it to cool in a container – maybe a preserving jar for example. 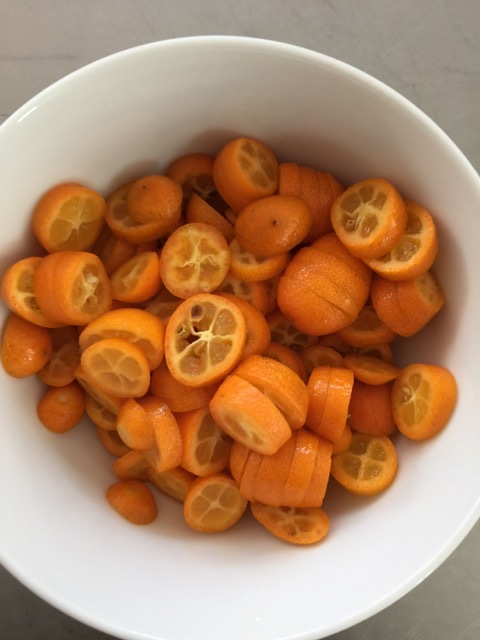 The you spoon some of the fruit out into a sieve and lift and lay to dry the fruit slices on some non stick surface like baking paper. The syrup can be used by itself on icecream or pannacotta etc or with the fruit. 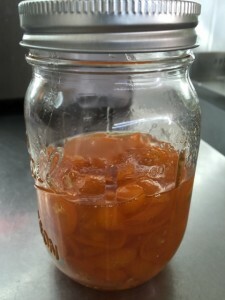 The fruit can be close to a glacé style crystal jelly by the time it has dried. 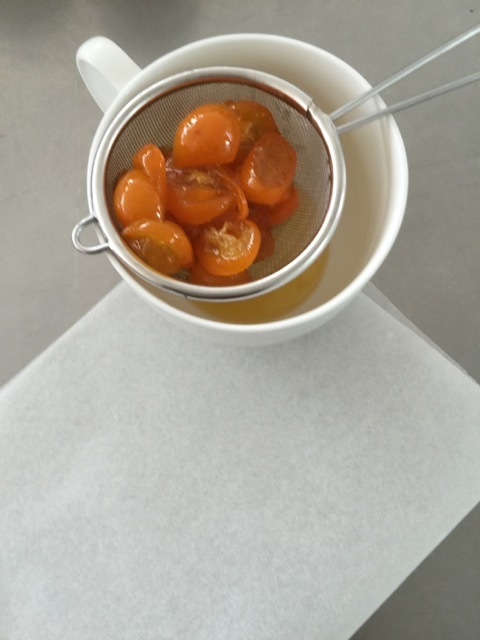 You can press them flat into very thin wafers as they dry for a nice visual touch on a dessert.